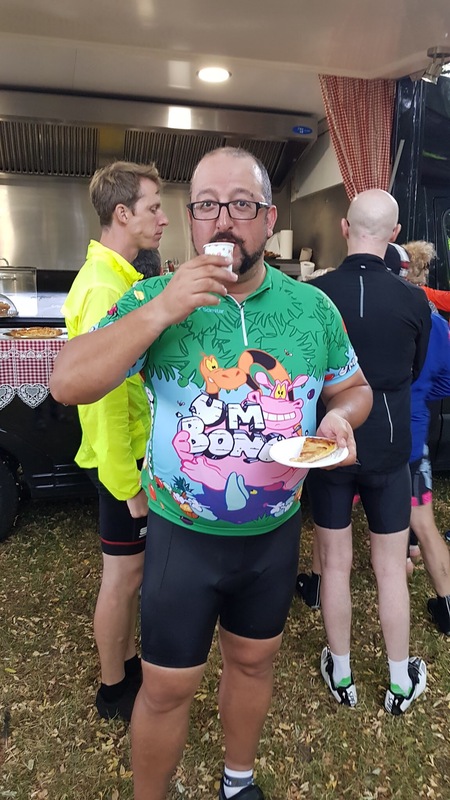 ……but what next for the Fat Blokes On Bikes? It’s actually quite strange to think that it is already a week since we returned from our big cycling adventure. 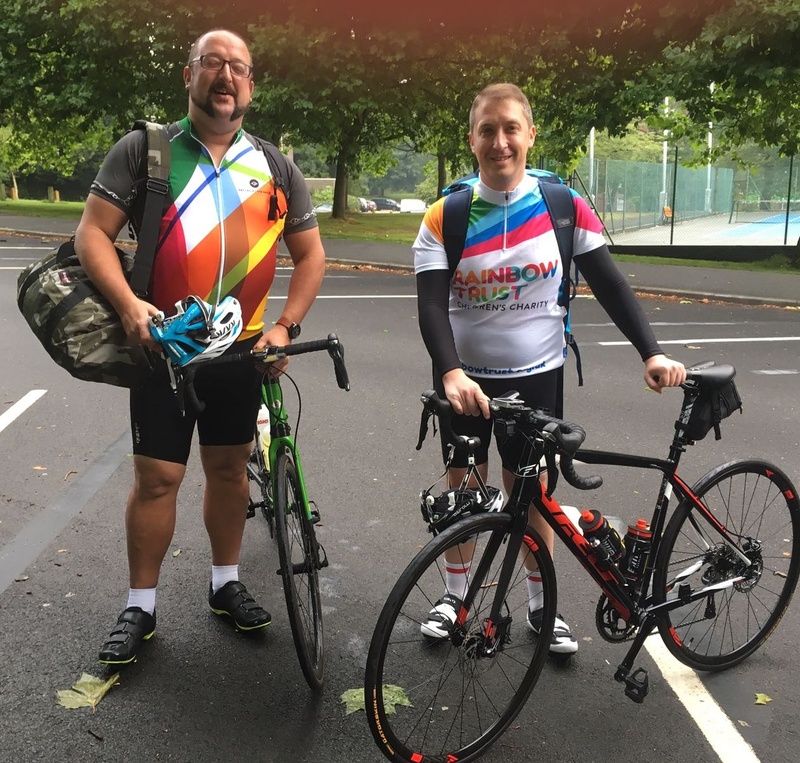 With time to reflect it has dawned on me what we actually managed to achieve, the distance we travelled on two wheels and the money we raised for the Rainbow Trust and it is truly amazing that we did it. This week has (with the exception of two days at the Oval) been slow and tedious by comparison. It was great to get back and see my family but I’ve felt flat all week, all the training and pedalling is done and that has removed something that I’ve focussed on for near on a year. Adam tells me this is known as post project depression, a recognised effect of the completion of a sizeable task and I can see why. I’ve spent most of the week thinking about what I can do next on a bike, I need something to plan! In truth I have enough on my plate to keep me occupied in the near future, my wife is due to give birth to our second child at any point so I doubt I’ll get to see my bike anytime soon anyway! 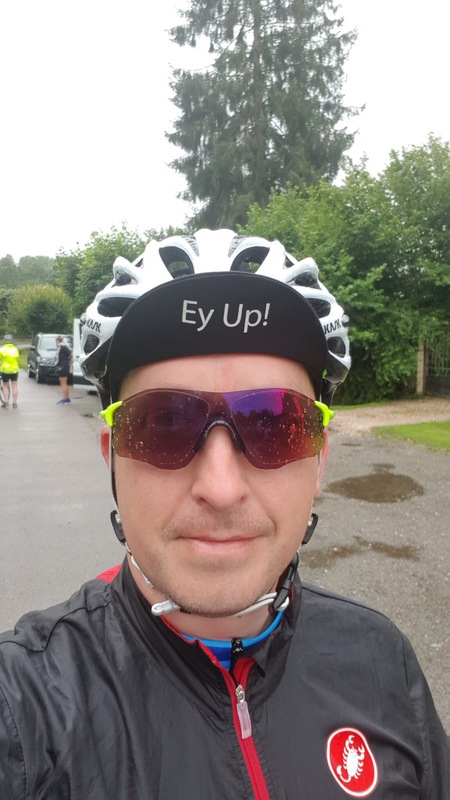 I watched the Surrey Classic Ride London today and that stirred my interest again, I would love to have a crack at that next year so that may be the target although London to Amsterdam also intrigues me as it is further than Paris but flatter! Adam and I do have one last bike ride to complete this year for the Stroke Association. 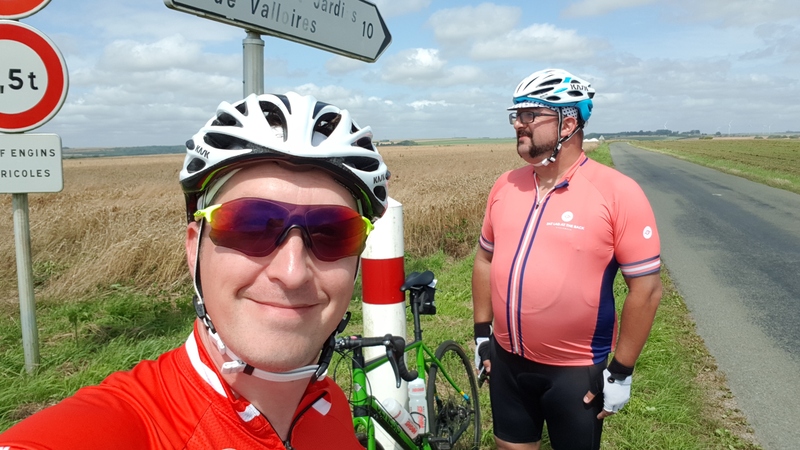 Making this journey had an extra perk seeing as the Tour de France finished in Paris yesterday. 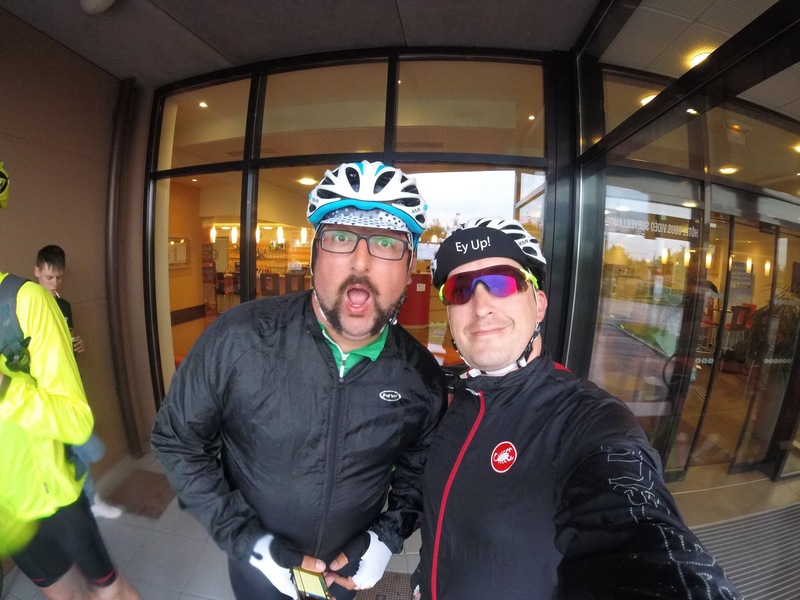 Having abandoned our practice of not eating too much before getting on a bike, Adam and I smashed through a multiple course breakfast in our hotel safe in the knowledge that there was no cycling to come at all……well, not for us. We headed to the Gare du Nord to leave our bags in the left luggage before going for a wander through the city. We had planned to go to the catacombs but the queue was heavy so we wandered back towards the centre of the city, through Le Jardin Du Luxembourg and over the Pont Neuf. When we got onto the Champs Elysees we were incredibly fortunate to find a spot which doubled as a seat AND a viewing platform to stand on, our view of the race was better than expected! There was a great atmosphere as the crowds gathered to watch the climax of the Tour, all different teams and nations were represented as the sponsors partied their way, carnival style, up the Champs Elysees before Sylvain Chavenel lead the way for the pro peloton. For us Brits we got to see our winner, Chris Froome, celebrate his fourth Tour win and you wouldn’t bet against him next year either! 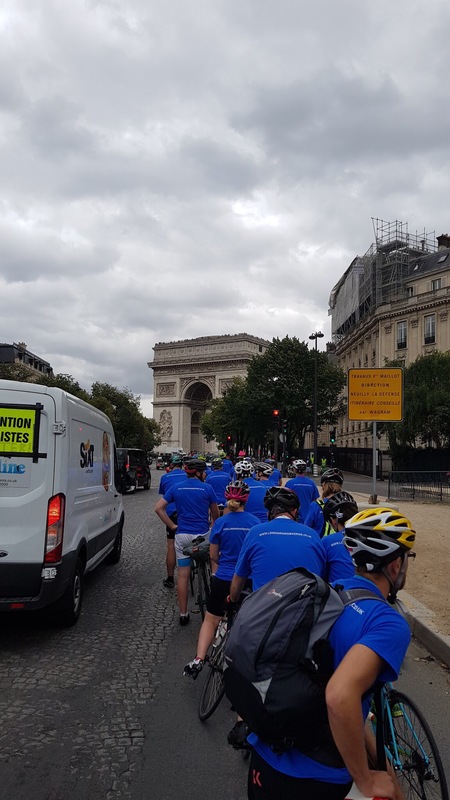 We left shortly after the second circuit as we had to be back at the Gare du Nord for our Eurostar home but it was amazing to witness the Tour, in Paris, on the Champs Elysees. So that was that, two tours done and time for home…. ……already started thinking about what to do next! The light drizzle that was falling as we wound our way back into the French countryside was only a preview of what was to come. The passing drizzle lulled us into stopping to remove the rain coverings but, as we reached the first big climb of the day at 8 miles, the rain returned in torrents. Il pleut….again! It hung around for a few miles, making the roads quite greasy and handling the bike became difficult at times, especially on roundabouts where surface water was laying. As we reached the first water stop the rain had started to subside which was a welcome relief, no more rain rage! The road to lunch was actually rather lovely, I rode the majority of the way with a couple we had met during the journey, David and Laura. Laura was there as a representative of the Teenage Cancer Trust who had 88 riders taking part and she told me that their wonderful charity would benefit by over £165,000 from this event. An absolutely phenomenal amount. As we hit the suburbs the traffic grew and the pace slowed, we stopped in a park for our lunch stop and the sun came out! We had a fair bit of time for lunch so it was good to sit down and relax a bit before moving to a holding point in the centre of Paris. 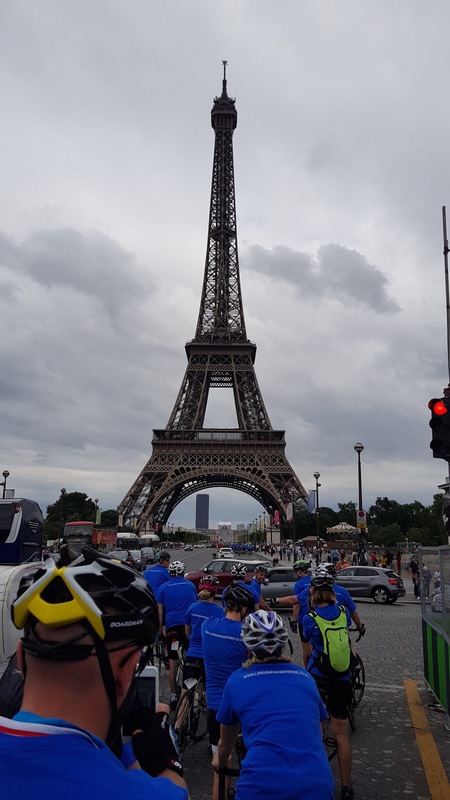 From there we put on our victorious blue tshirts and proceeded to the Eiffel Tower in one convoy of over 200 riders. We’d completed our mission! Job done! Game Over! There was only one obligatory photo left to obtain…..
I’ve loved every minute of this trip, part of me doesn’t want it to end but I can’t wait to get back to see my family. I’m not sure Adam wants to see his bike ever again! Thanks to all these legends for being a part of it, Fat Blokes out. I’m writing this from a hotel room in Beauvais at the end of our third day. ‘Where’s day 2?’ I hear you cry. Well, I’ll tell you. 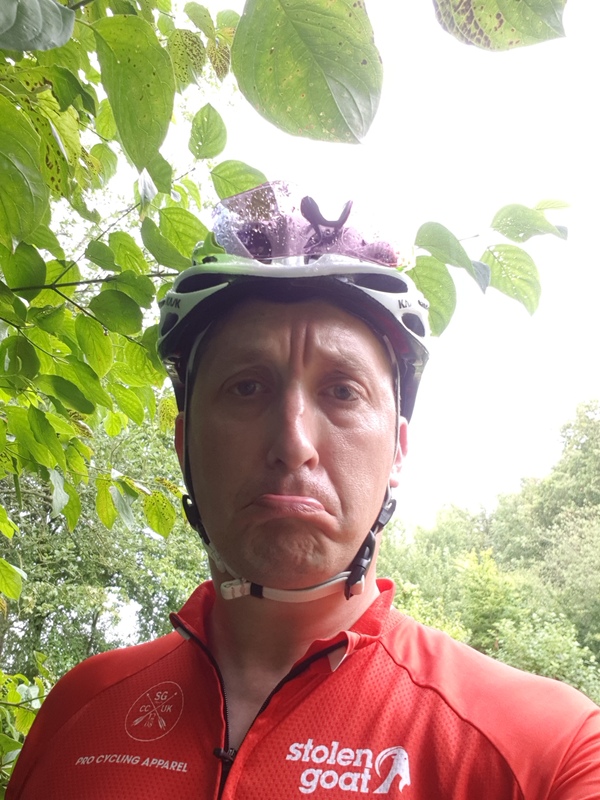 Day two was horrific, il pleut…..a lot! We reached Abbeville and pitched up at the lovely Mercure hotel. Following the brandy I had promised myself for enduring the rain, I turned in. Today was a different kettle of fish all together, brilliant sunshine and warm weather greeted our departure so we were keen to get going. After an unexpected beast of a hill not 10 miles in we were knackered! This was not a good sign and it was folllwed by what was loosely described as ‘rolling hills’! However, after linch, the parcours relented and aside from a couple of lively ramps, the day proceeded rather nicely! 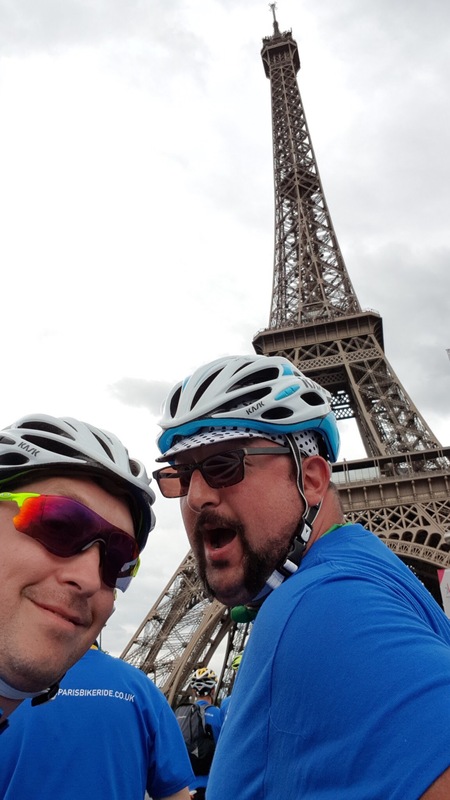 Tomorrow we ride the 50 or so miles to Paris and the Eiffel Tower. This has been one of the most difficult things I have ever done but the most fulfilling and rewarding. 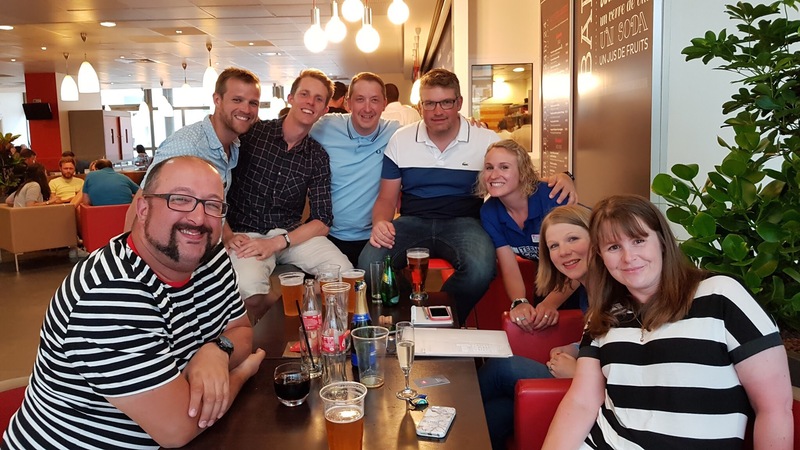 We’ve met some incredible people on our trip, from cancer nurses to survivors to people that just want to do some good in a frankly rotten world. So we’re finally in a hotel room somewhere in Calais. After starting out from Crystal Palace at about 7:30am this morning, we wound our way out of London and down through the Kent countryside towards the sea. About 9 hours and 90 miles later, we reached Dover and proceeded in convoy to the ferry. A short spin on weary legs and we finally reached a shower and a much needed bed! 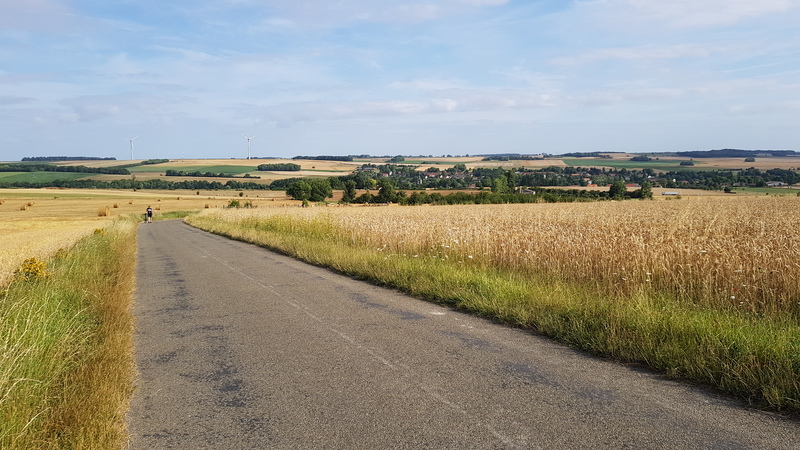 As planned, this morning I managed to get out on the bike to do a bit of a recce on part of the route we’ll be taking on Wednesday. 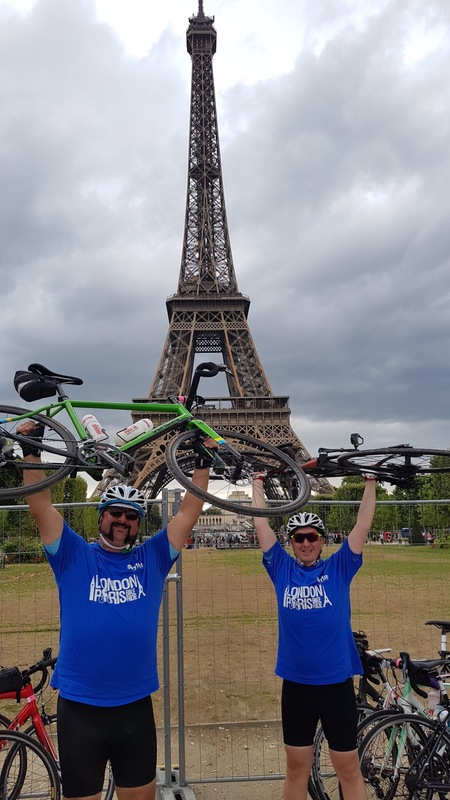 I’d planned a 40 mile loop that would include about 18 miles of the London to Paris route. You wouldn’t necessarily expect to find my country roads in around London but the road out of Addington is exactly that. It’s a narrow, winding road that climbs up to Farthing Street and around the back of Biggin Hill. 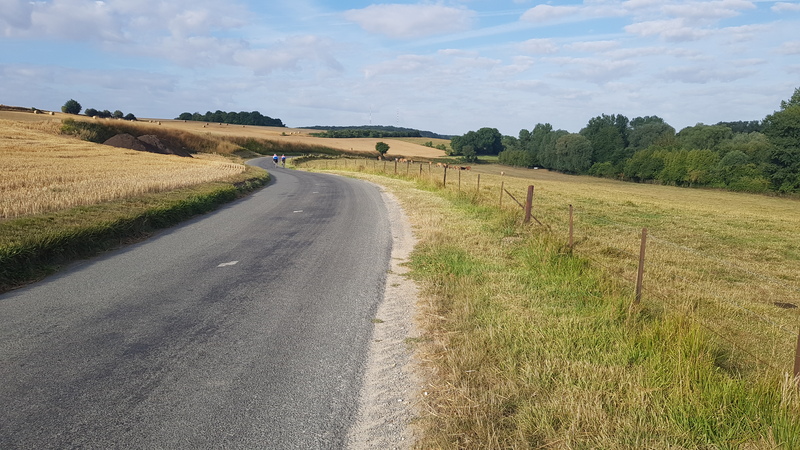 The narrow nature of the road can make it difficult for cyclists as there is little passing distance, even cars going in opposite directions cannot pass each other. I sat in behind 3 fellas who were on their way out to Eastbourne then turning back for Tunbridge Wells, the easy pace suited me fine!